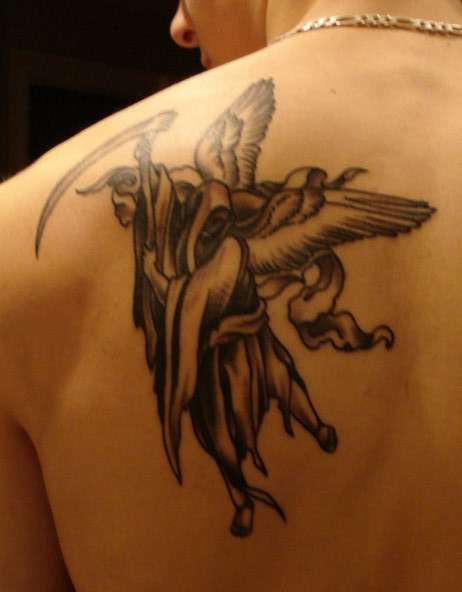 This is my conscience, instead of having a devil and angel on each shoulder, i combined the classic pose from the archangel michael, but had him wear reaper robes and carrying a scythe to have an aspect of evil/death present to even out the good. Thanks for your comment on my Spring Mandala :) I really love this twist on the Archangel Michael...there's so many of the traditional ones out there. Original and meaningful tattoos always mean the most to the wearer!